The Connecticut Audubon Society is thrilled with the passage of this important legislation. Our highest national policy priority was the permanent reauthorization of the Land and Water Conservation Fund. No longer will we need to fight from year to year for the reauthorization of this important funding source for land conservation nationally. Included within the bill is $435M in national funding and $1 million for land acquisition by the Silvio O. Conte National Fish and Wildlife Refuge. Most of that land acquisition work will occur in Connecticut over the coming year. Additionally there is funding for the Highlands Stewardship Act and Forest Legacy Program. Some of the highlands funding could come to Connecticut through a competitive process. The wild and scenic designation of the Farmington River and the Eightmile River is also wonderful and this has been a proposal that has been in the works for year. The President’s budget is a completely different issue. We have many concerns about many aspects of this budget proposal, but in the end it will have to be Congress that makes the final appropriations on all these programs, including LWCF. We will be working with our elected officials in Connecticut and with our conservation partners in other states to defend the funding for LWCF in the coming year’s budget, as well as other worrisome aspects of this budget, including a proposed 50 percent cut to the State Wildlife Grants Program and significant cuts to nearly every conservation program. There is also a proposal for a set annual appropriation for LWCF that may be introduced in the fall. The executive budget also proposed this level of a cut in the last budget, but Congress did not approve and went with $435 million. Additionally, the Recovering America’s Wildlife Act would offer stable funding to replace the State Wildlife Grants program, which is a perennial target for cuts. February 13, 2019 – Important and encouraging news out of Washington D.C. late yesterday: the Senate permanently reauthorized the Land and Water Conservation Fund, which since 1964 has helped finance almost 500 conservation projects in Connecticut and thousands more across the country. The bill passed 92-8 – a veto-proof majority – and is widely supported by Democrats and Republicans in the House. Inaction by Congress last year allowed the fund to lapse, threatening a long legacy of nationwide, bi-partisan conservation funding. The Connecticut River, conservation of which will benefit from the Land and Water Conservation Fund. Photo by Patrick Comins. The Connecticut Audubon Society has actively supported the effort to reauthorize the fund. We worked with a coalition to make sure our voice and the voices of other independent state Audubon Societies were heard in Washington. Our op ed essay published in the Hartford Courant in September 2018, just as Congress was about to let the fund lapse, argued that it would be a conservation tragedy not to reauthorize it. Connecticut’s Senate and House delegation all support the Land and Water Conservation fund. Connecticut Audubon sends its thanks to U.S. Senators Blumenthal and Murphy for yesterday’s action, and to Representatives Himes, DeLauro, Courtney, Larson, and Hayes for their steadfast support and leadership in the House. 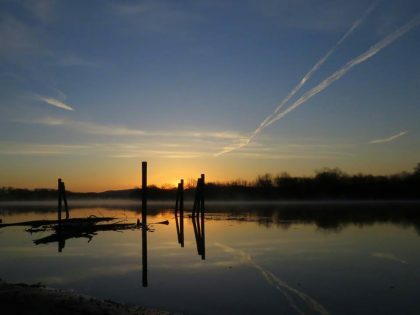 The bill that passed yesterday also includes a provision sponsored by Senator Murphy to designate the Farmington River and Salmon River in Connecticut as wild and scenic rivers. Money for the Land and Water Conservation Fund, established in 1964, comes from royalties paid by oil and gas corporations for federal offshore drilling leases; the money is then allocated to the state’s for conservation projects.